Featuring Janet Gearheart, Ronald Strother, Christine Benninger, Linda Owen, Rebecca Minelga, Eric Minelga, Nick Ursano, Alice Ursano, Cathy Wassenberg, Bill Wassenberg, Lisa King, Chris King, Patti White and Al White. Directed by Dana Nachman and Don Hardy. Distributed by Sundance Selects. 80 minutes. Not Rated. Puppies. The film starts and ends with puppies – wet, tiny, eyes still shut. Puppies. For many people, that would be all the inspiration that they need to see this film. Add to that the fact that these five puppies have specifically been bred to be trained as guide dogs for the blind. The story plays like any good reality TV episode; where only the best of the best (puppies and their trainers) can win “the prize” (helping the blind). And there you have Pick of the Litter. Full disclosure, my friend and I are dog people. The reviews for this film are stellar, so there was no question that we wanted to see this film. I knew the premise but did not expect the attachment to form so quickly both to the pups of the “P” litter and to their handlers. The film introduces us to the families fostering these pups at two months old, to teach them love and connection, to raise them for their noble purpose. We learn about their motives, the number of times they have fostered, their sense of accomplishment when a pup achieves guide dog or breeder status and their sense of failure if the pups are “career changed.” There is a lot at stake emotionally for these people, volunteering their time and attention to these pups for the first (up to) 16 months of their lives. We watch them go on field trips to school, to shops, on airplanes. We watch them train walking on sidewalks, streets, and avoiding hazards, including moving cars – all skills that the pups will need as guides to the blind. As the owner of a dog who walks into oncoming traffic, these scenes were pretty awe inspiring. The film also introduces the audience to two potential recipients for the guide dog puppies, both with qualifying visual impairments and lives that would benefit from the mobility and freedom that a guide dog would allow. Overall, while reality television competitions are not usually my cup of tea, Pick of the Litter sped by as we found ourselves rooting for our favorite pups and handlers. The musical score was perky and fitting, instrumental with a good piano base. The story was entertaining and heartwarming, certainly a good way to pass an evening. 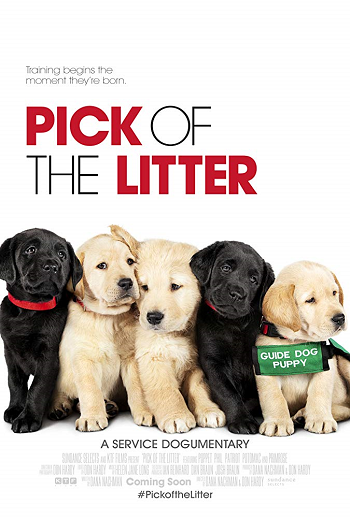 Pick of the Litter would be a great film for people interested not only in puppies as pets, but those interested in the art and challenges of training guide dogs. Copyright ©2018 PopEntertainment.com. All rights reserved. Posted: September 14, 2018. Tags: Al White, Alice Ursano, Bill Wassenberg, Bonnie Paul, Cathy Wassenberg, Chris King, Christine Benninger, Dana Nachman, dogs, Don Hardy, Eric Minelga, guide dogs, Janet Gearheart, Linda Owen, Lisa King, movie review, Nick Ursano, Patti White, PopEntertainment.com, puppies, Rebecca Minelga, Ronald Strother. Bookmark the permalink.